Join Peter Griffen in his studio for a weekend of hands-on painting and drawing. Enjoy the freedom to experiment, take risks and free up your painting and drawing. Inspired by the drawings of Brett Whiteley, the weekend will be spent engaged in creating abstract and semi-abstract drawings paintings and collages. 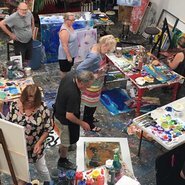 Explore different techniques and approaches to painting first hand, then take this inspiration to the studio for a full weekend of painting. Free form personal approaches will be encouraged using many and varied techniques, inventive brushwork, and collage All forms of experimentation, Intuition, self-expression will be encouraged. On Friday at 11am, meet Peter in the members lounge at the Gallery with a discussion and tour of Brett Whiteley: drawing is everything . This will finish at about 1pm. At 9.30am on Saturday and Sunday meet at Peter’s Leichhardt studio. Morning tea, prepared on the premises, will be served, followed later by a gourmet lunch with wine. Acrylic paint, brushes and acid-free cartridge paper are supplied. Bring your own brushes, paper and other materials to paint on (eg canvas) if you wish. Aprons are available or bring your own.